You have a choice in Home Services Companies, So thank you for choosing us! A lot of companies “talk” service, but we put this explanation in writing. 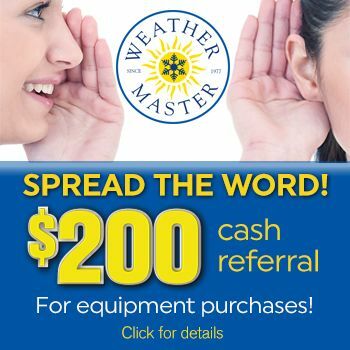 We'll ensure that service at Weather Master is prompt, professional, and done right the first time. When you Call. Most calls are from customers or referrals (which we love!) and ads. From your call we get a description of your problem or needs. Then a well-trained technician is scheduled and dispatched with the parts and tools for a quick solution. Who we are? We have been serving North Carolina residents for over 42 years with a focus on high quality and 100% customer satisfaction. We stand behind our products with exceptional warranties and offer a Lifetime Service guarantee on our services. Weather Master technicians are “Trust” certified. This means that they must pass strict drug and criminal background checks, possess a clean drivers license, pass N.A.T.E. (North American Technical Excellence) testing, pass a North Carolina D.O.T. physical exam (if applicable), be licensed individually by the state of North Carolina and wear identification badges and shoe covers while in your home. We believe in excellence in all areas, and we make it our job to earn your trust. What we’re doing to help your home comfort? We may ask you questions to help pinpoint the problem. Just like a doctor, we may ask you to describe your system’s “ailment”. You may see us measuring, adjusting or testing – you’re welcome to watch and ask any questions! Our goal is your goal – to perform the right diagnosis and procedure to get your system running smoothly again! How we charge? Inspections and maintenance are generally a set fee. For repairs you will get “Up Front Pricing” so you get the price before the job. You either approve or decline. Bottom line – we don’t make you guess what your repairs or upgrade will be. What we expect? Communication! Whether you like our work or not, let us know. We’d love to deliver satisfaction to your friends and neighbors, so spread the word! If we mess up (and sometimes we do) we want to make it right so let us know. We can’t fix it if we don’t know, so please give us that opportunity. Your trust is too valuable to leave to chance. And most of all, THANK YOU!